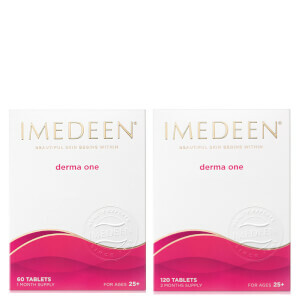 The Imedeen Derma One 12 Month Bundle is an outstanding value and investment in the future of your skin. This unique supplement combats the loss of radiance and lack of skin tone that can begin to occur as we age. 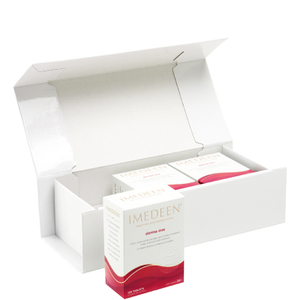 Imedeen's exclusive formulation helps skin cells live longer and maintain supple and smooth skin. Pores appear smaller and skin retains moisture better. This means that skin creams and lotions are not needed as much as before and will be able to achieve a more dramatic effect than if used alone. Skin quality and structure improves with each day of use. Specially formulated for those aged 25 and over to help fight the first signs of ageing. Recommended daily use of two tablets. Take with a glass of water. Results can be noticed after 3 to 6 months. Bulking Agent: E 460; Fish extract; Starch; Sodium-L-Ascorbate; Zinc Gluconate; Anti-caking agents: E 551, E470b. It's my first time purchasing Imedeen on this website. Delivery time longer than expected, (Delayed a week) But the product is good. I have been taking this for a long time. Good to buy when the website has promotion. The product is excellent. I have been taking the supplement for 2 months, my hair looks glossy and my skin is brighter. However, the only downside of this purchase is BE sent a wrong item to me this time. I don't live in the GB, and the delivery was to China. IHopefully your website can be more responsible for every distribution. I am in my mid-thirties and have been taking these supplements for 4 months. I was not particularly expecting a visible result but rather thinking it would be a good long-term investment in my skin. However I am very impressed! Fine lines have softened and my skin looks plumper and more dewy. Have recommended these to my friends and will continue to repurchase. I tried Derman about 5 years ago (when I was 28), and didn't feel anything go different on my face. Now that I am approaching 34, my skin does looked glowing after 14 days, will keep ordering them as part of my daily skin care. First, delivery fast, very good packaging. I have already started to take and my skin is smooth and the peeling phenomenon has disappeared, I feel great！！ I want to have this good thing to share with my friends, I hope more and more people will become beautiful!